Pretty much everyone knows about the Pocophone F1 by now, right? Its the extremely amazing value smartphone from Poco, a sub brand of Xiaomi. It offers the most powerful processor on a Smartphone today – Snapdragon 845 – with other amazing specs for a mere fraction of what the competition offers. The 6GB RAM variant comes in at PHP 17,990 and any variant packs a 4,000 Quick Charge 3.0 battery. It’s impressive to say the least, with Xiaomi’s own Mi8 the closest rival at PHP 26,000 – though technically the Honor Play’s Kirin 970 offering is it’s main competition. But that’s not what we’re here to discuss today. Because Mi Store Philippines have just announced the upcoming availability of the premium version of the Pocophone F1 – the “Armoured Edition” will be coming to the Philippines. As you may be able to tell, the Armoured edition packs the same specs as the regular “polycarbonate” (plastic) version, but you get the premium Kevlar back with a red and black design. Whether or not the premium feel is important to you will be up to your personal opinion, but hey if you’re looking to have a more premium Pocophone for the heck of it, then this is the way to go. The Armoured Edition back is made of Kevlar, but it probably won’t be bulletproof so don’t think it’ll stop a bullet. Sounds obvious now, but someone will ask for sure. 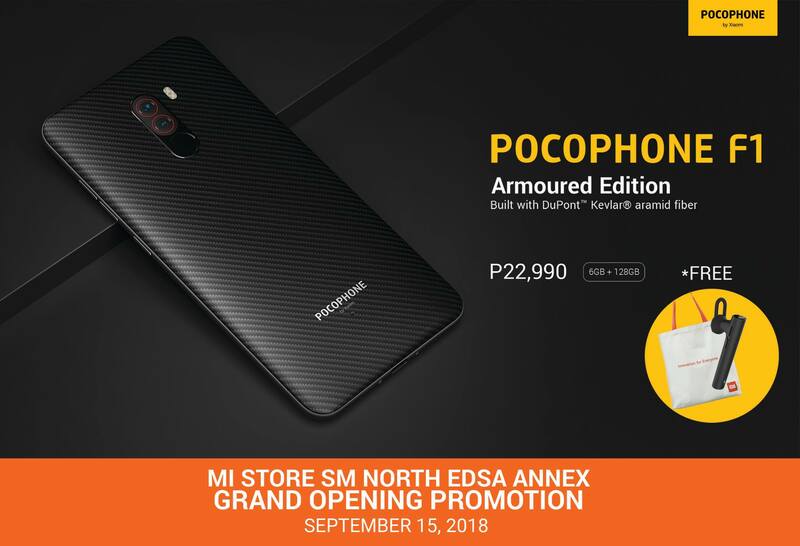 Based on the announcement, Pocophone F1 Armoured edition will be pre-selling tomorrow at the SM North EDSA Mi Authorized Store opening (Sept 15, 2018). The announcement says you get a free Bluetooh Headset and Tote Bag too. It also says there’s limited quantities but we’re not sure if that means limited quantities of the phone or the freebies. Well, given that the regular edition of the Pocophone is in limited quantities even today, we might as well assume the Armoured Edition will be limited too. If you’re planning on buying one, be sure to be ready to line up or be there early. One other thing to note is that Xiaomi has only announced the availability of the 6GB + 128GB variant. For us that’s perfectly fine, but some consumers are definitely more interested in an 8GB variant which doesn’t look like its coming yet.